I wear my red glitter boots to work a lot and every time I wear them they draw different reactions from my colleagues, so I figured I’d pull all the admiration together in one little love-filled post. First of all, no matter my mood or the weather, these boots always manage to put a smile on my face with their cute sparkles. I get ‘fabulous boots Jo’ shouted at me from various colleagues I cross in the hallway. I get asked if I felt it necessary to pair said glittery boots with glittery socks. To which I aways reply, yes, because there can never be too much glitter. I spend far too long in the ladies loos because that’s where they really come into their own under the harsh lighting, they’re at their most sparkly there and I get blinded. I get used to hearing compliments like, ‘they’re fabulous’ and ‘I just love your boots’, every single time I wear them. I feel like Dorothy in the Wizard of Oz and like to snap my heels together while uttering “Toto, I’ve a feeling we’re not in Kansas any more” to my imaginary pooch. 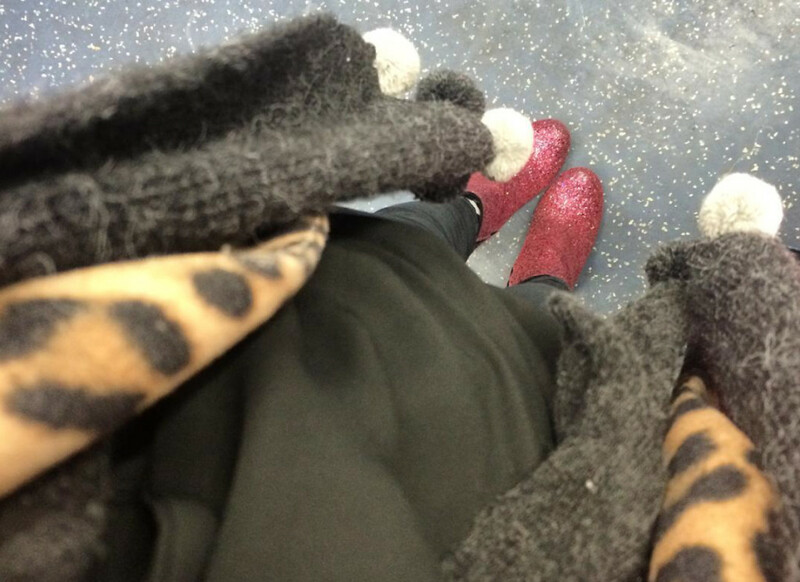 So there you have it, a day in the life of my red glitter boots. Find out what happened The Day I Wore White Patent Brogues to Work.